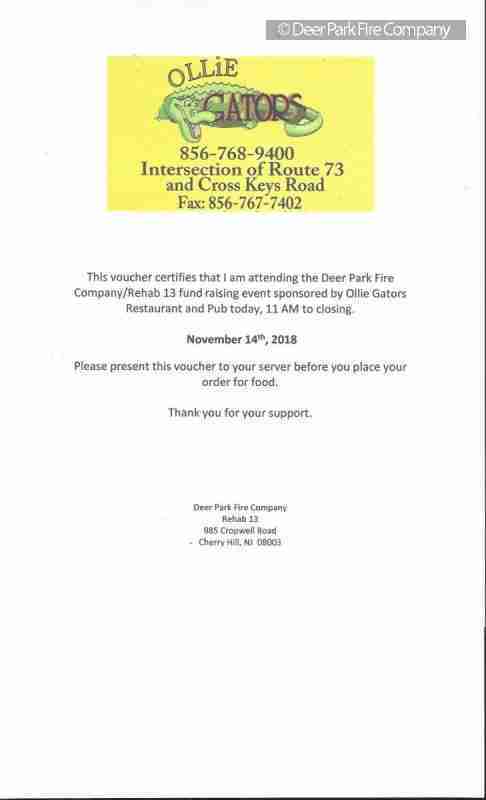 On November 14th, 2018 the Deer Park Fire Company/Rehab 13 is having its next fundraiser at Ollie Gators in Berlin on Cross-Keys Road between Route 73 and Route 30. The Rehab unit receives 15% fo all monies spent on food and beverages during the day starting at 11 AM until closing that night. Monies raised are for the purchase of food, beverages, and supplies that are distributed at the incidents that Rehab 13 responds to in a five County area in South Jersey. We have provided this service since 2004 and have been dispatched to over 750 calls for service in over 85 towns since April of 2004. Please come out and support our efforts to maintain our ability to serve the 1st Responder’s in our coverage area. If you are attending you will need to present this above voucher to your server for the Rehab unit to receive credit. E-mail the station at lcolacicco@deerparkfire.com and a copy of the voucher will be sent to you via return e-mail. Or you can stop by the station at 985 Cropwell Road, Cherry Hill, NJ – or contact one of members for a voucher.